We specialize in the production and distribution of internet radio programs and manage a voice acting agency. The ability to create and distribute content through a myriad of channels is one of Bushiroad’s strengths. The voice acting agency, "Hibiki" manages the affiliated voice actors and actresses under their label. Visit the official "Hibiki" site. 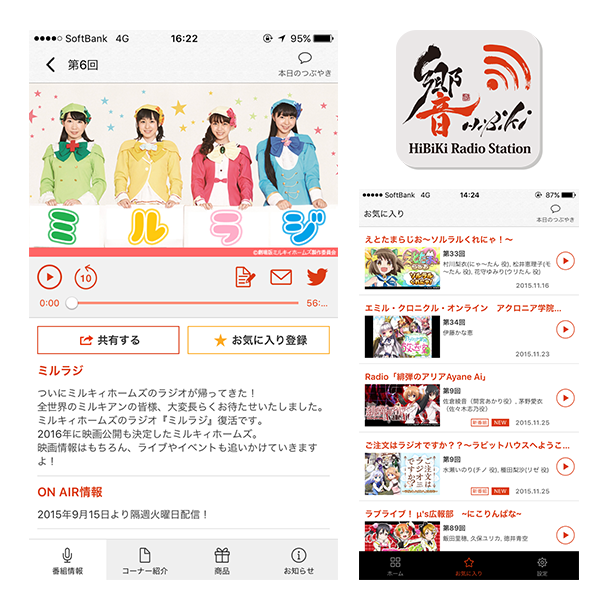 Hibiki Radio Station is an internet radio station that distributes promotional programs of Bushiroad’s various contents such as anime, games, voice actors and actresses. These radio programs are planned, produced and distributed regularly. Visit the Hibiki Radio Station site.